California takes about 4.7% of what a business produces in taxes — which happens to be the national average. The government take is higher in Alaska (13.8%), New York (5.5%) and Florida (5.3%). Even Texas, known for rolling out the red carpet for business, pocketed more than California — 4.9%. That’s according to an annual study of the tax burdens in all 50 states by the Council on State Taxation, a business-friendly group led by senior executives of Chevron Corp., General Electric Co. and other major corporations. “California is pretty middle-of-the-pack when it comes to business taxes,” said Joseph R. Crosby, the organization’s senior director of policy. Granted, there’s more to business friendliness than just taxes. California has more stringent environmental rules than most states, for example. And the article notes that California’s corporate tax structure tilts downward: big companies tend to pay fairly low taxes while small companies pay higher taxes. (Thanks, Chamber of Commerce!) 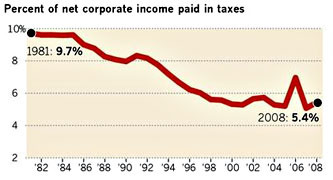 Still, most of the griping you hear comes from big companies, and most of it revolves around taxes. But the fact is that their tax bill just isn’t especially high.